Prom 72, originally uploaded by Thoroughly Good. “It’s one of the highlights of the season,” said one Prommer in the Lanson Arena Bar shortly before the concert. At least, I think that’s what she said. The quote may not be word for word, but you get the picture I’m sure. “Bernard Haitink, Murray Perrahia, Mozart twenty-four and Shostakovich four,” she continued. Amid the predictable cries of elitism on my part, I have to confess that I love the shorthand way of referring to concert works. I’ve always loved the shorthand. Why bother wasting precious time saying the word “symphony” or “concerto” when those you’re talking to know exactly what you’re referring to by virtue of having read the programme before the conversation began. Pretensions aside (and I’m full of them) and the first half underway, I was relieved to hear that my previous concerns about any prevalence of misjudged applause during my favourite piano concerto on my self-nominated official birthday had been allayed. Bernard Haitink, on the other hand, did have some concerns about extended coughing in between movements and a door slamming in between movements from the side the choir seats. This seemed obvious by the way he held his conductor’s baton and refused to continue until a suitably sombre silence had again descended over the auditorium. I don’t think I would have seen all of this had me and significant other Simon not been occupying seats one and two in the Grand Tier box number three, overlooking the stage. These were purchased seats I might add. 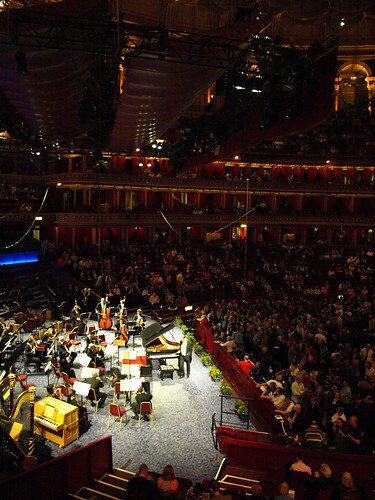 Lots of people reckon they know where the best place is to listen to concerts in the Royal Albert Hall and to a certain extent I find it difficult not to agree that promming in the first three rows of the arena offers the best for sound, especially in loud works. But nothing prepared me for the seats in the Grand Tier. During Shostakovich’s predictably highly orchestrated and cinematic lesser-known symphony, we got to see a 100 strong band working in teams. Shostakovich’s string writing would drag my eyes to the violins and then my ears would distract me over the percussion section whenever an unexpected crash or snare drum roll was inserted. This was the work which Shostakovich “withdrew” from performance after the “writers” at Pravda denounced his opera Lady Macbeth as “muddle rather than music”. It was his fifth symphony which was penned as a result and, although powerful, engaging and ultimately as satisfying to listen to as the fifth is to play, I’m a shameless convert to his fourth symphony based solely on one listen. That’s powerful for me, considering I knew nothing of the fourth symphony before Prom 72 and engaged with the work as a result of getting a fresh visual perspective on orchestral playing. Hurrah for seats in the Grand Tier. Now all I have to do is find enough disposable income to afford a seat there every single night.